Probably the most fragrant tree we know, Michelia alba is in flower now and will be for most of summer. The flowers are definitely not spectacular to look at, being small and rather sparse for the size of the tree, spidery in form and cream. But for a knock you down fragrance which permeates the air all round, alba is amazing. In fact it is apparently the fragrance of Joy perfume. The tree gives us a few worries because it is growing considerably larger and faster than we anticipated and we wonder if we have it planted in the right place. Glyn Church tells us he had to cut one of his out because it outgrew its position. At least it is upright, rather than spreading and its foliage is lush tropical green all year – possibly because it comes from tropical and sub tropical areas of Asia. Michelias have now been reclassified as magnolias – a somewhat arbitrary decision with which we do not agree so we will continue to use the former names. Alba was given to us by an elderly Chinese gentleman who told us that it was sacred and we could sell one to every Chinese family in NZ. We tried, believe me we tried but it does not set seed and it very rarely strikes from cutting so it has to be grafted and it is not easy to reproduce that way either. We have seen it used as a street tree throughout Asia and we think they aerial layer it. For the botanically interested, current information is that alba is probably a natural hybrid from the orange flowered Michelia champaca and all alba plants throughout the world are therefore the one clone. Champaca sets seed freely but we have yet to hear of anybody who has proven experience with alba showing fertility. The plant appears to be a genetic dead end. For a photograph of the tree in our garden, check out Magnolia Diary 14. This entry was posted in Plant collector and tagged Abbie Jury, evergreen magnolia, Michelia alba, The plant collector, tropical magnolia, tropical michelia on 19 February 2010 by Abbie Jury. 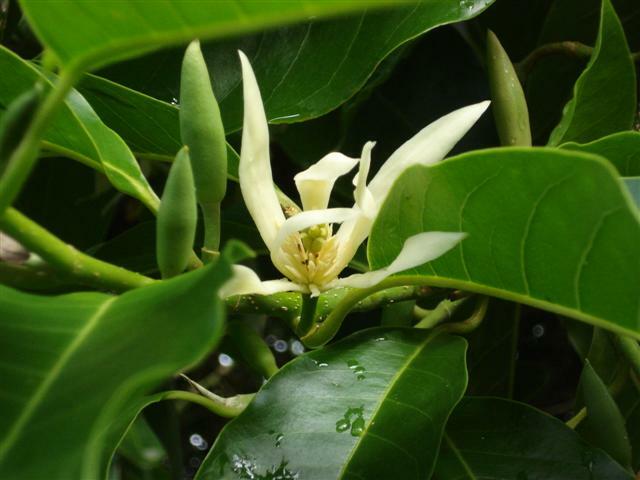 Just wondering do you sell and deliver: Michelia plants. You are right about the Chinese and this Michelia alba . I posted this, and some emailed asking where to buy it. I have been told that Michelia “free Spirit” PVR is a low growin/ground huggine for highly scented and will grow in light shade. I can’t find a reference. Can you help me with information as I would like to grow tham at Levin. Never seen it, don’t know anything about its breeding (though it does not have PVR, just a PVR application) but we have absolutely zero interest in a ground hugging michelia. Spent blooms and leaves will not fall – they will merely sit in a mush on top. Ground cover camellias have the same problem, though they drop fewer leaves so the michelia may be even worse. Sorry to be a wet blanket but I just think you would want to see that plant before you buy it.